Buckeye Wildlife Solutions is proud to offer squirrel removal services to homeowners and commercial clientele in Columbus, OH. Squirrels are fidgety little critters, homeowners can hear them constantly scurrying around when squirrels are in the attic. Our BWS team offers services of squirrel trapping, damage repair, and attic cleanup. Our experience in squirrel control allows us to get the job done in a timely manner. Call today if you are having squirrel problems in Columbus, OH & surrounding areas. CITIES WE SERVICE for squirrel removal– COLUMBUS, DUBLIN, POWELL, HILLIARD, LEWIS CENTER, UPPER ARLINTON, DELAWARE, WORTHINGTON, WESTERVILLE, BEXLEY, PICKERINGTON, PATASKALA, GALENA, SUNBURY, NEW ALBANY, BLACKLICK, CLINTONVILLE, GRANVILLE, CANAL WINCHESTER, GROVE CITY, GALLOWAY, OBETZ, JOHNSTOWN, WHITEHALL, DOWNTOWN COLUMBUS, & GRANdVIEW. 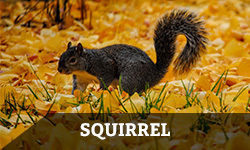 Squirrels will mainly cause damage to the outside regions of a home. 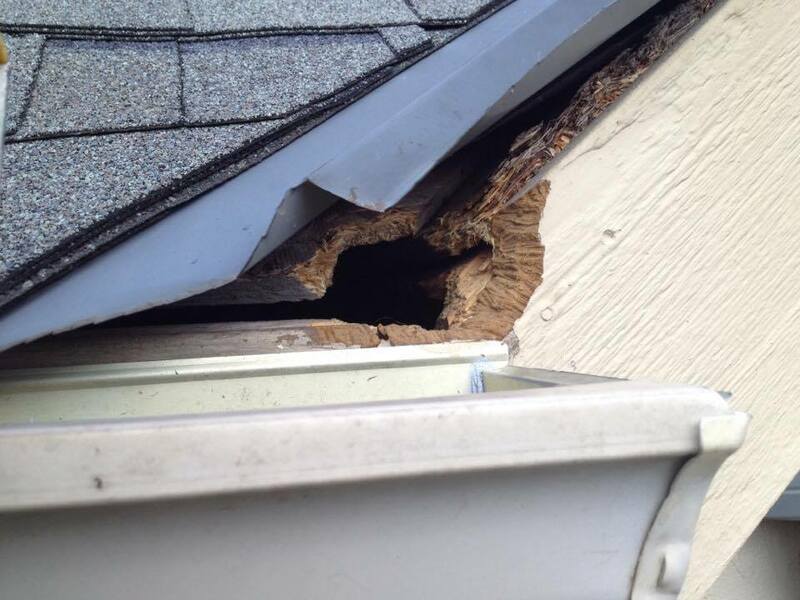 Typical damage includes squirrels chewing holes through fascia boards, dormers, and vents. When squirrels are in the attic they will burrow through insulation and create nests. The nests are made from material that squirrels will drag in from outside. More serious issues can also arise when squirrels chew on electric cables in the attic, causing concern of a fire hazard. BWS tackles these problems by offering services of patching up holes and cleaning contaminated material in the attic. We use high quality materials to patch up squirrel damage, which provides a permanent solution. If vents have been used as an entry, we will install barriers over the vents to keep all animals out, not just the squirrels. Trapping must take place first, before repairs and attic cleanup. We carry specially made traps meant to catch squirrels quickly. Ohio Law does not require us to euthanize squirrels, so we release them in a rural area far away from your home. Trapping squirrels will require experience, it’s not as cut and dry as some people might think. We will set traps over, or close to, the point of entry. Generally the entry point will be up around the roofline, because squirrels use trees or power lines to jump on the roof and create their entry point wherever it is most convenient for them. Because of this fact, we have to use our ladders to access the upper portion of your house to set traps & retrieve captured squirrels. Call Buckeye Wildlife Solutions for squirrel trapping services in Columbus, OH. Zip Codes – 43017, 43015, 43065, 43026, 43123, 43035, 43064, 43209, 43221, 43081, 43082, 43085, 43011, 43041, 43044, 43045, 43060, 43061, 43066, 43067, 43069, 43074, 43081, 43102.